Wilders' poor act in Dutch Parliament, last Tuesday, sent him to a lonely wilderness. His score in yesterday's poll was disastrous: His party sank from 11 to 9 seats. The author of the small "Fitna" movie was disappointed by the lack of Muslim violent reactions after it's publication, last week, on LiveLeak. Under the guidance of US-based Ajaan Hirsi Ali, the populist politician had shifted his attacks from the Muslims to the Dutch Government and it's Prime Minister. The latter had, by "capitulating on beforehand", committed high treason to Western values. But the Government managed to give proof of the fact, that it was not Mr. Wilders who was the victim, but the Dutch people, Dutch business and Dutch soldiers in Afghanistan (three gravely wounded by taliban roadside bombs last week), who had become hostages of Wilders' provocations. However, xenophobia continues to be a top-seller in Holland. Former member of Government Ms. Rita Verdonk, who was excluded from her conservative party last year, staged an optimistic and profesionally designed roadshow last Thursday, with the financial help from a number of real estate businessmen. "Proud Of Holland" is the name of her "movement" that does without members and internal democracy. "Iron Rita", "Rita La Caimanna", adds pride to prejudice: Like President Bush on May 1st, 2003, she features herself at the helm of a ship. The main difference between the two is the absence of the sign "Mission Accomplished" behind the courageous sailoress. In stead of the lamentations of Fitna, Fitness and Pride became the message. Did we win by the shift from Wilders to Verdonk? I am not so sure of that. 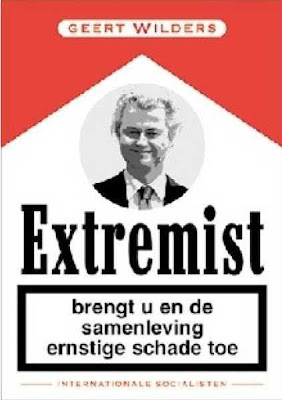 Verdonk's xenophobia is more all-compassing than Wilders' obsession with Islam. She advocates a rigid confinement to supposedly exclusive Dutch values and traditions. Any foreign influence is banned. In my opinion: Very un-Dutch. The small country managed to survive, in spite of high waters, in spite of annexation efforts by larger countries, by being extremely flexible (some say: opportunistic) and by hiding it's pride behind a show of tolerance and hospitality. It has been in that way, that the Dutch made large profits, tricked out contenders and continue to this day, to sell elsewhere prohibited drugs to the world. She is a possible second Mrs. Thatcher. Watch Your Booty!